For Salt Lake City Councilman Van Turner, the city’s new Landlord/Tenant Initiative is as much about good landlords as it is about bad slumlords. The aftermath of a hasty moveout from a small rental home on California Avenue drives this point home for Turner. 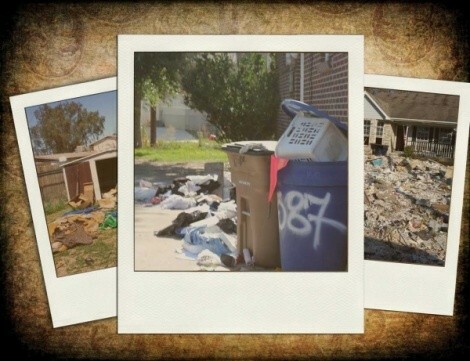 An old computer screen, a soiled carseat, CDs, clothes and other garbage are strewn across the home’s lawn, while inside the house, empty rooms are marred by mystery stains. Turner says the absentee landlord told him that he would get around to cleaning it up after he got back from vacation in two weeks. “That’s the reason we’re trying to clean up these bad landlords,” Turner says. Under Salt Lake City’s new voluntary good landlord program, that landlord could receive training on zoning and housing laws if he opted in and would pay a fee of $20 per rental unit. While similar programs adopted in 11 cities across the state have been touted for helping reduce crime and save city expenses, the enactment of Salt Lake City’s program is already drawing the ire of small landlords who criticize the program as just more burdensome bureaucracy, while both small property owners and affordable-housing advocates worry the program could lead to spiked rental prices. Salt Lake City’s good landlord program follows the logic of similar programs in cities like South Salt Lake and Ogden that emphasize carrots over sticks when it comes to encouraging slumlords to be good landlords. While those who opt out of the voluntary program pay $342 per nonparticipating unit, those in the program register a $110 business license and pay a $20 fee per unit. They also have to undergo a four-hour training course every three years, track all evictions and occupancy denials and sign lease agreements with tenants that outline that criminal activity is not allowed in the rental. Donna Evans, landlord of three units, feels the program is more municipal red tape getting in the way of private business. According to the mandatory lease addendum agreement the landlord and tenant must sign, for example, a landlord could be kicked out of the program for not evicting a tenant who has a loud party or perhaps smokes pot in the unit. Evans, a former mayor of West Jordan City in the late ’90s and early 2000s, also says the programs are money-making ventures. According to a city budget briefing prepared in May 2011, the program was designed to hit nonparticipating landlords with the fee as a means to recoup estimates of extra city police, fire and code-enforcement services. According to the report, $1,804,631 in new revenue could be generated through the program that would be offset by only $291,704 in expenses to hire new inspection, permitting and enforcement staffers. Evans sees this program “as a simple way to bring more money into the city without saying they’ve raised taxes when, in fact, they have. But only on a select group of people, but it’s the people who are the most vulnerable,” since landlords will just pass increased fees onto renters, she says. Between new business-license fees and the added work of complying with the program, Evans opted out, seeing it as a cheaper and less intrusive option for a small landlord like herself. Turner says an October briefing on the program was not promising; more than a dozen landlords like Evans gave feedback that they’d rather avoid the hassle of participating. “If you just charge $1 a day more, then you’ve got that [$342 fee] covered,” Turner says. As a landlord himself, Turner admits the paperwork requirement for landlords to detail building specifics ranging from roofing to plumbing and even the width of window wells can be intimidating. “A little 80-year-old lady is not going to be able to adequately fill it out,” Turner says. For Sonya Martinez, a housing advocate at the Salt Lake Community Action Program, good-landlord programs are usually bad news for her clients—especially with programs that require landlords to conduct mandatory background and credit checks, which generally keep many low-income Utahns out of affordable housing. But she notes that’s not a requirement of Salt Lake City’s program, which also has the benefit of requiring twice-annual meetings between landlords and their tenants to address concerns. “It provides an incentive for landlords to do what they’re supposed to be doing already—keeping their property up to code, livable, safe and healthy,” Martinez says. Increased rent is a concern for Martinez, who also worries some landlords will just pass costs onto renters. She believes the program works but could do more to advocate for renters. “One of the biggest concerns we have is that tenants in Utah do not really have a voice,” Martinez says. She argues the program’s lease agreement should spell out renters’ rights and require landlords to agree to uphold those conditions just as renters currently agree to not engage in illegal activities or act as a nuisance. Currently, the Utah Apartment Association—the state landlord lobby group—is the only organization offering the training. Both Martinez and Turner believe other groups need to offer the training, as well. Paul Smith, director of the Utah Apartment Association, however, says the training is comprehensive and that the UAA is the sole trainer because it’s the only organization that’s applied so far to offer the course. He also says four hours of training every three years is not a burden. “Landlords who say they know everything scare me, they really do, because the law changes regularly,” Smith says. In the past five years, Smith says, the rental world has shifted dynamically. Where once meth labs were the scourge of rental properties, they’ve now all but dropped off. In the same time frame, Utah’s foundational Fit Premises Act has been updated and municipal zoning across the state has changed dozens of times. The program is a good investment for cities, Smith says, citing South Salt Lake reporting a 25 percent reduction in crime since instituting the program. Even if enrollment is slow now, he says it will take years to bring Salt Lake City’s 14,000 unlicensed duplexes and single-family homes into the program.